Similar to carbon dioxide, methane absorbs the sun’s heat, warming the atmosphere and causing climate change. There is a major difference between the two, though. Carbon dioxide is responsible for most of the warming, as we produce larger amounts of it than any other greenhouse gas. However, methane traps much more heat than carbon dioxide and, in the first two decades after its release, is 84 times more potent than carbon dioxide. So. California Gas Company’s Aliso Canyon facility, on a hill above the Porter Ranch community. Credit: Scott L, CC BY-SA 2.0. 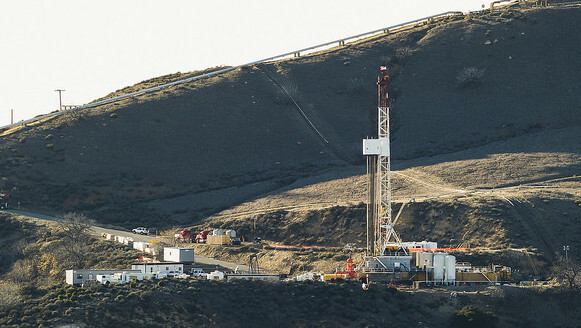 In an article published on February 25 in the journal Science, scientists reported that the massive Aliso Canyon methane release is the second largest of its kind recorded in the U.S. It is surpassed only by the natural gas leaked after the collapse of an underground storage facility in Moss Bluff, TX, in 2004. However, the scientists point out that the Aliso Canyon release is expected to have a larger climate impact when compared with the Moss Bluff release, which caused an explosion and subsequent fire that combusted most of the leaked methane and immediately formed carbon dioxide. Indeed, the scientists estimated that the mega-leak released 97,100 metric tonnes of methane into the atmosphere over 112 days. 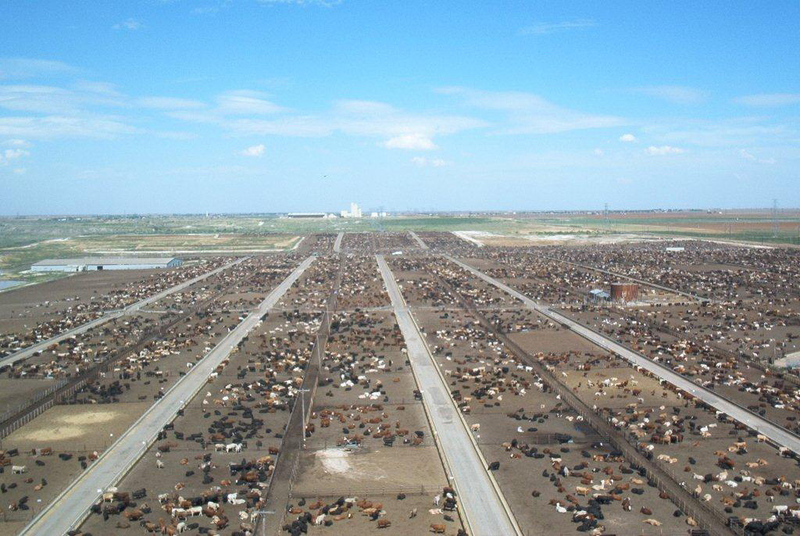 Fortunately, the leak is also drawing increased attention to the broader problem of “fugitive” emissions from compressed natural gas fueling stations, landfills, geological seeps, and cattle. In addition, extensive research efforts by the Environmental Defense Fund show that methane is leaking at every stage of the oil and gas supply chain. Gas field, Texas, USA. Credit: Lars Plougmann, CC BY-SA 2.0. 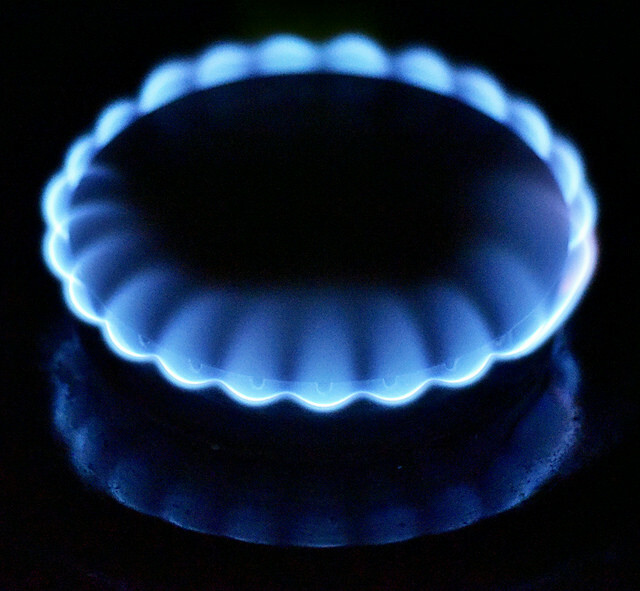 Natural gas is touted as an efficient source of energy because its combustion produces more energy per carbon dioxide molecule formed than coal or oil. 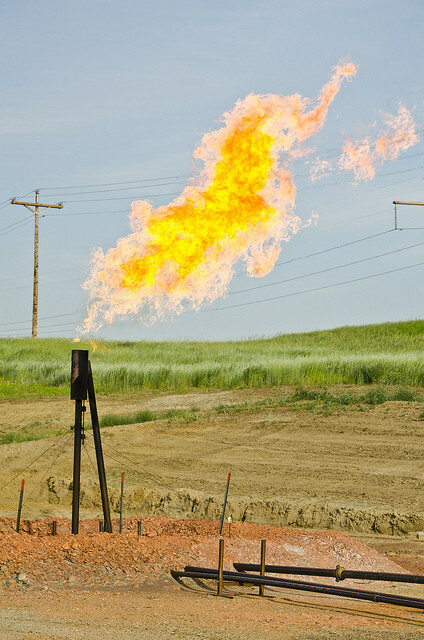 However, the natural gas leaks that occur from the point of extraction to the point of consumption offset the climate benefits. 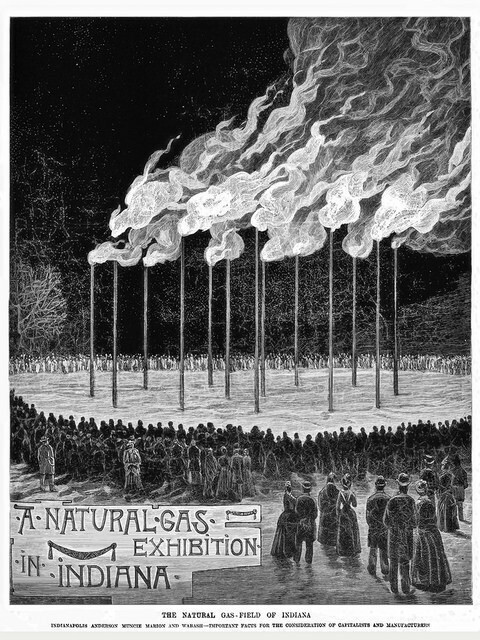 Vintage engraving of a natural gas exhibition, Indiana, 1889. Credit: eyecmore, CC0 1.0. The new rules are expected to transform the nation’s energy sector—that is, if they withstand legal challenges. However, more action is needed: these rules don’t go far enough, as they only address pollution from oil and gas facilities that will be built in the future, not the ones that already exist and are polluting the air as we speak. Gas stovetop. Credit: theilr, CC BY-SA 2.0. Meanwhile, the Environmental Defense Fund and Google Earth Outreach have been wiring cars with methane sensors and testing them out in Boston, MA; Burlington, VT; Chicago, IL; Indianapolis, IN; Los Angeles, CA: Staten Island, NY; and Syracuse, NY. The goal is to find and assess leaks under streets and sidewalks, thus creating maps of natural gas leaks. The maps generated so far (there will be more to come) underscore the persistent and widespread challenge of leaks and show the positive impact of resources dedicated by utilities and regulators to fix the problem. The information gained through this collaborative venture is expected to help gas companies prioritize their efforts to repair and upgrade pipelines, while at the same time providing a powerful advocacy tool to accelerate the process. Hopefully, this program will be expanded to include locations around the innumerable number of fracking sites across the country, and not just urban areas. I posted a comment on here before but I can’t seem to find it but I agree with this post people need to be held responsible for the methane gas that is being released into the environment. We need to currently have laws and regulations in place not just laws for the future. The release of methane gas is doing some severe damage to our environment and it needs to stop because global warming is very real and can have dramatic effects. This article was a real eye-opener for me about the properties of natural gas. I had always heard that natural gas was considered to be “cleaner” than oil, but I never knew that it was essentially putting out more energy per CO2 released. It turns out that natural gas produces roughly half the CO2 of coal and about 75% of the CO2 ¬put out by gasoline (1). It’s a pity to see that the new regulation of methane emissions only applies to buildings yet to be built. Perhaps these seemingly incomplete regulations are a solution that can be put into effect more quickly in efforts to initiate methane emission regulations, before the much more daunting task of inspecting every existing oil facility for methane leaks. However, it is imperative that the government initiate the inspection of these facilities as soon as possible because that is where the greatest potential for substantial change lies. This blog was informational, surprising, and opened my eyes to the potential dangers of methane gas in our environment. There is so much talk in the world about carbon dioxide and how it contributes to global warming, however, you rarely hear on the news about how methane gas is an even bigger contributor. Even though the lifetime of methane in the atmosphere is much shorter than that of carbon dioxide, it was surprising to find out that methane is a lot more efficient at trapping radiation and heat than carbon dioxide. According to the EPA, in addition to methane leaks, over 60% of methane emissions comes from human activities, including industry, agriculture, and home/business waste. “Methane is emitted into the atmosphere through the production, processing, storage, transmission, and distribution of natural gas.” Cattle, buffalo, sheep, goats, and other livestock actually emit methane during their digestive processes! Finally, as waste decomposes at landfills, methane is generated. 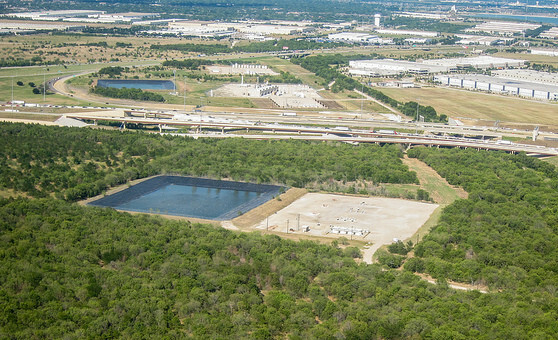 “Landfills are the third largest source of methane emissions in the United States.